TODD-AO is not a new brand of vitamin capsule. 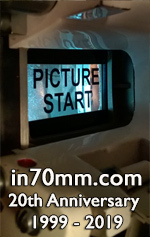 It's the trade name of a new process of motion picture photography and projection and the name of a new corporation which handles the equipment and installs it. The name reportedly was born of a compromise between a conviction held by Michael Todd and a belief held by others. Todd was convinced that the process which he had dreamed up should, bear his name; others believed that the American Optical Company, which developed the system from the Todd idea, should have a part in the billing. Conviction compromised with belief and TODD-AO resulted. This hyphenated designation is a strange marriage in corporate history, for its brings together Todd, who in his quieter moments is as placid as an erupting volcano, with the American Optical Company, a "trust" which has a detached, cool, scientific approach to the idea Todd views with enthusiasm. American Optical, which has a well-deserved reputation in scientific and manufacturing circles, is an old firm and the fact that it is a "trust" attests in some measure to its dignified position. For "trust" in the Massachusetts sense of the word has not the same meaning that it has in the Sherman and Clayton Acts. It is a term which goes back to the early days of the Commonwealth's law, which provides for voluntary associations which are in effect similar to the corporations of the present day. Todd on the other hand has had a career that has been anything but placid and which has included sensational successes and crashing failures. The TODD-AO Corporation came into being at Wilmington, Delaware, in August, 1953, after an agreement had been reached by the American Optical Company (which had developed the TODD-AO system) and Magna Theatre Corporation (which had been formed to finance research on the system) that all patents, developments and the like would be turned over to the new corporation. This new corporation, whose stock is not offered to the public, has eight shares of Class A voting stock, which are divided equally between American Optical and Magna, thereby preventing either company from dominating the corporation. In addition the TODD-AO Corporation has 10,000 shares of Class B Stock, 375 of which are owned by American Optical and 625 by Magna. The new corporation is licensed by its incorporators to deal in equipment. It is to provide the cameras and licenses to producers who wish to work in the TODD-AO system. At present there are seven such cameras available, with 10 more to come and a deal is now being negotiated with Mitchell Camera Company whereby Mitchell may manufacture 19 more. The new corporation is also the source of supply for theatres wishing to install the TODD-AO system. At present two are so equipped - the Rivoli in New York and the Egyptian in Los Angeles, both of which are United Artists circuit houses. The Downtown, another UA house, in Los Angeles is also being considered for equipment. The corporation may expand its activities, in the equipment line slightly by offering to exhibitors generally an all-purpose projector, which permits projection in the TODD-AO system, and several different systems, a spokesman for the company said. But it definitely has no plans to enter exhibition and it will not become a manufacturer. The items which at present go into the TODD-AO process are either manufactured by American Optical or by sub-contractors retained by American Optical and this set up is distilled to remain unchanged. The system itself will be offered theatres in a package. President of TODD-AO is Henry Woodbridge, president of American Optical; George Skouras, president of Magna Theatres and United Artists Theatre Circuit is board chairman; with L. Douglas Netter, Jr., former Altec sales manager as vice-president in charge of exhibition equipment, James M. Landis, secretary, and George J. Solomon, treasurer. Working under this over-all organization is a staff that is to be expanded, consisting of Philip Propper, assistant to Mr. Netter and in charge of advertising, and a technical group consisting of Schuyler Sanford, chief camera technician for TODD-AO; Fred Hynes, who handled sound for "Oklahoma!" and its TODD-AO Sound Supervisor, and two supervisors of theatre installations - Fred Pfeiff and Al Childs.